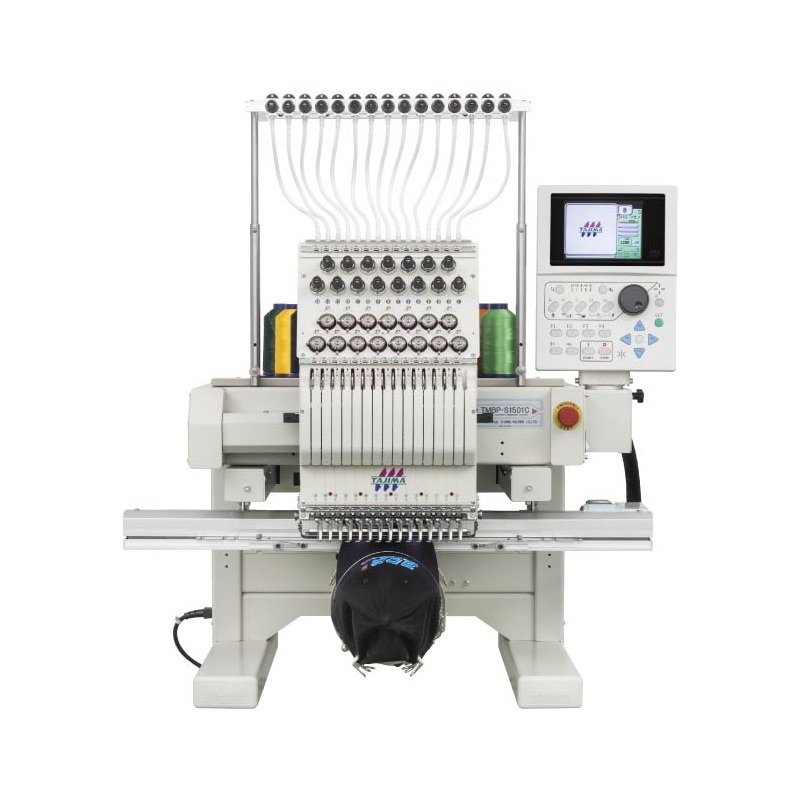 The TMBP-SC Series from Tajima Embroidery has once again raised the bar for single head embroidery machines. A newly designed slim cylinder allows for embroidery on challenging items such as small pockets and socks. The cap driver has its own shaft which allows for high speed cap production with precision results. Additionally, the TMBP-SC has a streamlined Cubical Frame Design which has no sides allowing the TMBP-SC to embroider on over-sized jackets, blankets or large duffel bags as well as polo shirts and caps. Huge Opportunities in a Compact Space! Versatility and mobility combined with easy-to-use features makes the TMBP-SC series the ideal machine to get your embroidery business up and running, quickly & easily. You can take on the most challenging jobs with confidence, knowing that the Tajima TMBP-SC can handle it all. The Tajima TMBP-SC Series is the perfect machine when you need to embroider large bulky items but do not have the space for a full size embroidery machine. The lack of sides eliminates size restrictions from left to right making the TMBP the ideal machine for hard to hoop items such as large bags and jackets. The TMBP is also great with traditional sized items such as left chest and hat designs. The ability to embroider on smaller items is dictated by the shaft of the cylinder arm. A smaller shaft provides greater flexibility for embroidering on smaller items that would otherwise not fit around the diameter of the shaft. Perfect for pockets, socks, sleeves and much more. Options include Cap frames, Table top and Border frame, Swarovski stone attaching device, Air clamps, Tubular sock frame, Pocket frames & Sequins. All new machines come complete with a 2 year warranty, installation and operator training tailored to your needs.